US consumption is some 108 billion cups per year, the UK uses an estimated 2.5 billion paper cups every year. The disposable cone-shaped paper cup was invented in 1908 by Lawrence Luellen, and in 1912 Luellen and Hugh Moore began marketing the Health Kup, another paper disposable cup. The Health Kup was designed to create a means for people to drink water from public water barrels without spreading germs, which occurred when people would use a common (shared) cup or a dipper to hold the water. The Health Kup was later renamed to Dixie Cup, and was named after a brand of dolls. Luellen and Moore later developed a disposable paper ice cream cup, which included lids with images of sportspeople, movie stars and animals. Some companies, such as coffee retailers and doughnut shops, sell their products in disposable cups. A 2011 book estimated that a chain of doughnut shops used one billion disposable coffee cups in a year, enough to circle the Earth twice. A 2012 article in OnEarth said that Starbucks used over four billion disposable coffee cups in 2011. The Cup Noodles brand of instant noodles uses expanded polystyrene foam cups to contain the product. Hot or boiling water is added to the dried noodles in the container, which cooks the product in a few minutes. Nissin Foods began marketing the product in foam cups in the early 1970s. The manufacturing of paper cups contributes to water pollution when chemicals such as chlorine, chlorine dioxide and reduced sulfides enter waterways. 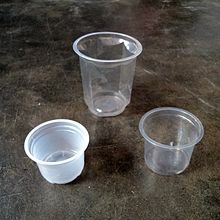 The manufacturing of foam cups contributes to air pollution when pentane is released into the air. The plastic content in plastic-coated paper cups contributes to the plastic pollution problem, when cups are disposed as litter. The curbside recycling of polypropylene containers has slowly increased in some developed countries, but is still rather limited. McDonald's switched from foam cups to paper cups in 2014, and is moving to recycle paper cups in the UK, as of 2016, in partnership with Simply Cups and James Cropper. Several coffee chains offer a discount if the customer brings along their own cup. At festivals such as the Bavarian Oktoberfest, costs due to theft or breakage are avoided without using disposables: The customer pays an upfront fee for a drinking glass or mug and receives a rebate at its return. ^ Hill, M.K. (2010). Understanding Environmental Pollution. Cambridge University Press. p. 519. ISBN 978-1-139-48640-8. ^ a b c Worrell, W.A. ; Vesilind, P.A. ; Ludwig, C. (2016). Solid Waste Engineering: A Global Perspective. Cengage Learning. p. 395. ISBN 978-1-305-88835-7. ^ Webster, K. (2000). Environmental Management in the Hospitality Industry: A Guide for Students and Managers. Environmental Management in the Hospitality Industry: A Guide for Students and Managers. Cassell. p. 146. ISBN 978-0-304-33234-2. ^ a b Szaky, T. (2014). Outsmart Waste: The Modern Idea of Garbage and How to Think Our Way Out of It. BK currents book. Berrett-Koehler Publishers. p. pt70. ISBN 978-1-62656-026-0. ^ a b Zimring, C.A. ; William L. Rathje, C.E. (2012). Encyclopedia of Consumption and Waste: The Social Science of Garbage. SAGE Publications. p. pt1026. ISBN 978-1-5063-3827-9. ^ a b "McDonalds' Switch to Paper Cups Source of New Demand for International Paper". Retrieved 6 September 2017. ^ a b "McDonald's UK To Trial Plastic-Coated Paper Cup Recycling". 25 January 2016. Retrieved 6 September 2017. ^ a b c d Aydelott, J.; Buck, D. (2007). Read Write Respond Using Historic Events. Teacher Created Resources. p. 89. ISBN 978-1-4206-8237-3. ^ Chronicle, San Francisco (November 13, 2015). "Much ado about a Starbucks disposable cup". San Francisco Chronicle. Retrieved April 16, 2016. ^ a b Miller, G.T. ; Spoolman, S. (2011). Cengage Advantage Books: Sustaining the Earth. Cengage Learning. p. 288. ISBN 978-1-133-16928-4. ^ Palmer, Brian (April 2, 2012). "Meet the Change Makers: Starbucks's Quest for a Better Cup". OnEarth Magazine. Retrieved April 19, 2016. ^ a b Roe, M. (2004). Market Research in Action. Thomson Learning. pp. 64–65. ISBN 978-1-86152-938-1. ^ Harlan, J. (2011). Ramen to the Rescue Cookbook: 120 Creative Recipes for Easy Meals Using Everyone's Favorite Pack of Noodles. Ulysses Press. p. pt11. ISBN 978-1-61243-004-1. ^ Tara Evans (2017-04-10). "Daily grind discount: The coffee chains that give you a discount for bringing your own reusable cup". The Sun. Retrieved 2017-08-31. 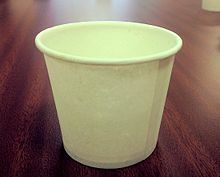 Wikimedia Commons has media related to Disposable cups. This page was last edited on 14 February 2019, at 12:50 (UTC).